Voter ID: Eric Holder suing Texas, alleges intentional voter discrimination. 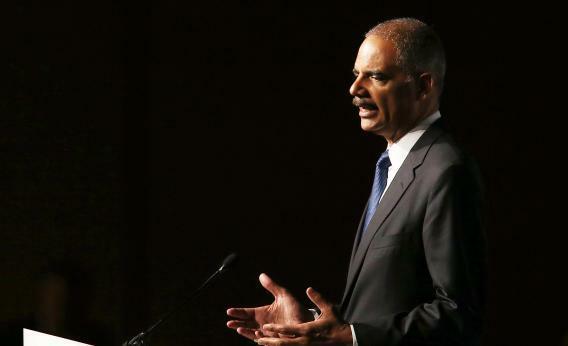 Attorney General Eric Holder takes disappointing Supreme Court cases in stride. Eric Holder just won’t leave the Lone Star State alone. The attorney general will sue Texas over its voter ID law, the Justice Department announced Thursday. “Today’s action marks another step forward in the Justice Department’s continuing effort to protect the voting rights of all eligible Americans,” Holder said in a statement. But hang on, wasn’t there a Supreme Court case about this? No matter, Holder says. From his statement: “We will not allow the Supreme Court’s recent decision to be interpreted as open season for states to pursue measures that suppress voting rights.” He must be thinking back to how in D.C., it became open season on humans after the high court struck down the city’s handgun ban. The forthcoming suit is only the “latest action” from the DOJ “to protect voting rights,” Holder says. What were the previous actions? Well, in case you missed it, Holder made Texas the first target in his voting-rights counterattack after he lost the Shelby case. One month after the SCOTUS decision, Holder asked federal judges in San Antonio to apply the Voting Rights Act’s “pre-clearance” review process to voting-law changes made in the state—the very pre-clearance provision Texas was freed from when the high court struck down Section 5 of the VRA. Turns out pre-clearance can still be required under Section 3, so long as there’s “intentional voting discrimination” going on, which is exactly what Holder is alleging. There’s little doubt that the Texas law encourages voter discrimination, though whether the state aims to discriminate against fraudsters or, well, Democrats is up for the judges to decide. See you next summer for another Supreme Court decision on pre-clearance!